BRONZE. Decanter World Wine Awards 2017. Vintage’16. ; SILVER BACCHUS. XV Edition of International Bacchus Competition 2017. Vintage’16. ; SILVER. 2nd Challenge to “The Best Spanish Wine for the USA”. Miami 2013. Vintage’12. ; THIRD PLACE. The Best Galician Wines Houston. Texas 2013. Vintage’12; GREAT GOLD. Guide of Wines, Spirits, and Wineries of Galicia 2013. Vintage’11. ; GOLD. 1st International Competition “Albariños al Mundo”. London 2012. Vintage’11. ; GOLD. National Tasting in “Aula Internacional de Catadores (AULINCAT) 2009. Vintage’08. ; BRONZE BACCHUS. First Edition of International Bacchus Competition 1996. Vintage’95 ;GOLD. EUROALIMENTACIÓN’91. Bilbao 1991. Vintage’90. ; GOLD BACCHUS. INTERVIN’90. Barcelona 1990. Vintage’89. 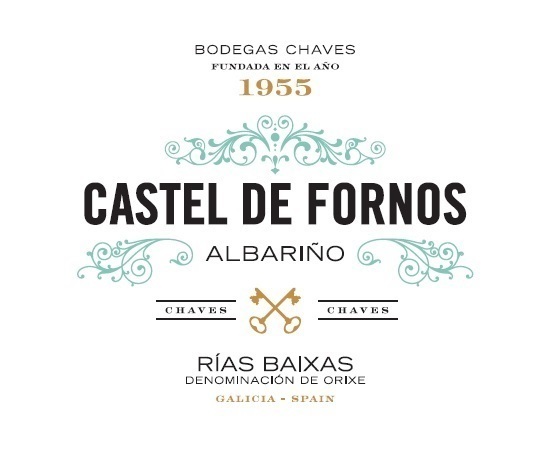 Its most important wine is the Albariño Castel de Fornos, which is made from free-run juice and also with a treatment on lees for months. Castel de Fornos is the name of the first vineyard of the winery. Castel de Fornos, has managed to position itself in the most demanding markets, national and international. Bright straw yellow with green tints. Castel de Fornos is an intense wine which shows complex aromas. Floral hints at the beginning (gardenia, rose, orange blossom) are followed by flavors of apricot, orange peel and honey. Combined with aromas of herbs (laurel, anise and mint), the palate has a distinct richness.